Direct bolt-on Russell Brake Line Kits bring the ultimate in braking performance. They improve your braking performance for competition or every-day driving. 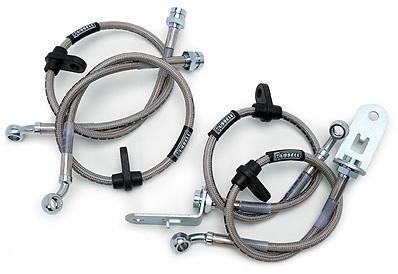 Replacing the OE rubber hoses with Russell brake lines reduces brake pedal travel for more consistent braking. Featuring stainless steel braided hose with zinc-plated fittings, these brake lines are factory assembled for convenient installation. They meet the strict guidelines of the U.S. Dept. of Transportation MVSS-106 requirements. All Russell brake line kits are for stock applications unless noted otherwise.